There has to be a first time for everything. And it’s almost always difficult. Personal and professional growth is no exception. Like most worthwhile things, it’s worth it. But it takes work. Fear and trepidation are common at the start. Observe the little kids who may be in your life. They’re learning things for the first time. Some things, they dive in without hesitation. Other things, they delay, they put it off, they halt and hesitate. Because they’re afraid. We never get past it. Young or old, fear and nervousness sometimes hit us. Mostly, we’re afraid of what we don’t know or understand. It’s always hard at the start. Executive coaching is focused on helping the client grow. Bula Network is my company. Bula is a Fiji term meaning life, particularly carrying the connotation that life is good. It’s also analogous to “aloha” in Hawaiian and means both “hello” and “goodbye.” I’ve never been to Fiji, but I stumbled onto the word about 35 years ago, fell in love with it and started using it as the greeting on all my intercompany memos. Every memo would begin with, “Bula!” I only had to explain the meaning once (like just now). You’ll remember what it means forever. A decade ago the term “network” was incorporated into my company name because of the network of services I offered. When I stepped away from the C-suite I was knee-deep in roll-up-your-sleeves-get-your-hands-dirty consulting. It soon morphed into more coaching. And along the way I began to realize network was much more congruent with my philosophy and activity — it was no longer about the network of services I offered, but it was more about connection and collaboration. It’s always been about PEOPLE. Bula Network style is my style. Mostly, it’s not about me. It’s got very little to do with me. It’s about YOU, the client. My natural tendency and gift is to provide clients with a safe, secure and confidential space where they can achieve their own growth, improvement, and transformation. Dr. Henry Cloud words it better than I ever could. He says we need people with whom we can be “careless.” Not careless in the sense that we’re thoughtless, but careless in the sense that we don’t have to be careful, worried they’ll use what we say against us. That’s not difficult for me because my work isn’t about judgment. Or me imposing whatever I may want. It’s about you deciding for yourself what you most want to achieve. It’s about you deciding you’d like to be held accountable in a non-judgmental way for the choices you make – the goals you’re aiming to achieve. My executive coaching isn’t therapy, but it is therapeutic. It’s dialogue. It’s not a gripe gut session. There’s no room for whining when we’re working hard to grow. There’s all the room in the world though for asking questions, answering questions, thinking about assumptions, having answers questioned and opening yourself up to other viewpoints you may not have considered. It is, in a word, empowering. Intentionally. My coaching is special because I learned through the years to lean into the particular strengths that come naturally easy for me. Chief on the list is EMPATHY. That’s why I’m not prone to sit in judgment of you. My empathy drives me to seek understanding of you, your issues and whatever else you care to share. It also drives me to help you find the most ideal solutions to those challenges and to work harder to see and seize opportunities. OPTIMISM. I’m super practical. I’m not theoretical. For decades I’ve operated multi-million dollar businesses. I’ve had to make payroll, manage cash flow, attract customers, serve customers, hire people, fire people, train and encourage people. I’ve had to negotiate long-term leases and short-term business deals. I’ve purchased merchandise, marketed, sold and executed the delivery of products and services. I’ve run advertising campaigns, created systems and processes and achieved my fair of success and failure. I have no Ph.D. or MBA. What I do have is a gift of reading, knowing, understanding and communicating with PEOPLE. My internist is an old guy who has practiced medicine for as long as I’ve practiced business. I love him because we’re birds of a feather – not that we’re both old, but that we’re both looking to find the remedy. His craft is more scientific and less subjective, but he asks lots of questions. Like me, he seeks to understand before he dives in to diagnose or help. So do I.
It’s always about one central thing. Foremost, it’s about YOUR higher human performance, then it’s about how you can help serve the people who report to you. Whenever I’m asked about my view of leadership, management, culture, business building, organization building or any other terms you care to shoot at me…I always answer with one word, “SERVICE.” It’s going to always come back to service. How can we best serve each other? How can we serve ourselves? The key to our personal and professional growth is SERVICE. And it’s not the selfish kind where I don’t care what happens to you as long as I get what I need or want. The focus is on the things that connect us. We’re in it together. All of us. With somebody! You have employees, direct reports or a team. Those people matter. You and me, working together, are in it together. If your end of the boat sinks, so does mine. 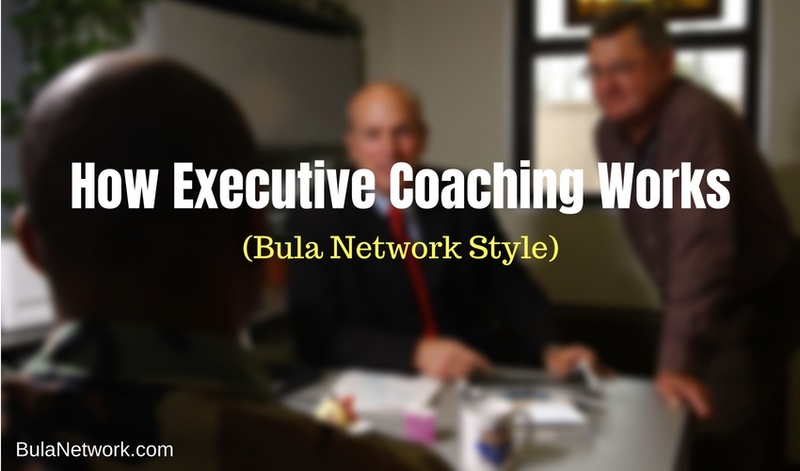 That’s how executive coaching Bula Network style works. The pain is best described as growing pains! I won’t promise you it’ll always be comfortable, but I promise you it’ll always be safe and confidential. Trust is primary. I’m capable and willing to put in the work necessary to earn it. I promise every client a number of things…mostly, I’ll never betray you. I’m driven to move the needle of your success. I’m not interested in becoming your new best friend. I’m not interested in making you feel better while nothing changes or improves for you. I know next Tuesday morning is going to happen. And you’ll be prone to forget the promises and commitments you made to yourself. Bula Network executive coaching isn’t about high brow principles or concepts. It’s about climbing higher, reaching new summits and achieving the things you may not have thought possible before (or maybe you have). None of us are going to achieve our full potential. That’s why this is such a fun game, LIFE. We never arrive. My role is to help you play the game of pursuing that potential as rewarding as we possibly can. It’s your life. Your choice. Your decision. And I always respect that. I’m just honored to be able to serve in some way to help you.